Last week I started reading Lance Armstrong's War. For those not familiar with the book, it's essentially a play-by-play of the months leading up to and including the 2004 Tour, including profiles of all of the key contenders. Aside from the fascinating look inside the pro peleton, for me the best part of the book has been to read about the training program Lance, and his trainer, Michele Ferrari, used to prepare. As an aside, most of us in the states who get our tour coverage via versus/OLN were under the impression that Chris Carmichael was the main dude when it came to Lance's training. Wrong. Lance is a co-owner of Carmichael Training Systems, and so has a vested interest in giving the impression that Carmichael deserves some credit for Lance's success. But it's pretty apparent reading this book, including comments from other Posties, that Ferrari is the man when it comes to Lance's training. 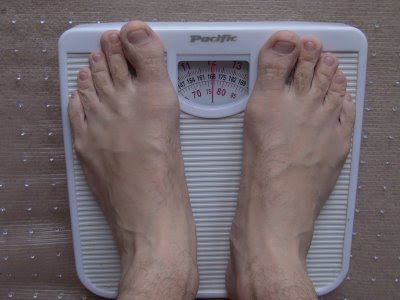 For me the true revelation in reading this has been that I am entirely too fat (those are not my feet, by the way--just some random picture from the web). I have no delusions of ever being pro-peleton skinny. I simply don't have the genetic makeup for it. But I could certainly shed quite a few pounds without ever missing them, and would probably get a bit faster in the process. According to Ferrari, for every kilogram of weight lost while maintaining the same wattage, Lance can climb 1.25% faster. Mathematically, this makes sense, because Lance started his 2004 training season at about 80kg, so losing one kilo is also 1.25% of his body weight. The mathematical corollary to this is that for every 1% of weight lost while maintaining the same wattage, a cyclist can climb 1% faster. For the weight weenies out there, it doesn't matter if the weight comes off of body or bike, it's all the same. So unless you are skinny enough to race a grand tour (which I found out means that your cheeks are sunken, your upper arms are as delicate as a girl's wrist, and your skin is paper-thin with no fat underneath it, to the point that your kidneys, liver, and other organs start to become visible through the skin), forget dropping the coin to buy those carbon bottle cages, and just cut off your food supply instead. It's a lot cheaper, but perhaps not as fun to talk about and show your friends. When I started reading the book last week, I weighed about 80kg. It was enough to scare me into not eating, and I set a goal to drop 8 kilos over the next 8 weeks. So far, I'm down 1.5 kilos. If I can drop eight kilos, I should be able to climb 10% faster. On a ride like Lotoja, where I spend a good 3 of the 11 or so hours climbing, that would take 20 minutes or so off of my time. Last year, we finished in 11:20, with a ride time of 10:40. If I can climb 20 minutes faster and spend 20 fewer minutes at the aid stations, that gives me a 20 minute fudge factor for less-favorable wind conditions or other problems but still getting a sub-11 finish. That would be quite nice. I sure am glad to know those aren't your feet! :) Good work, bro! I don't know what 80 kilos translates into anyhow, and I'm too tired to do the math, so don't be embarrassed. And by the way, those are some dang ugly feet. Don't get too skinny. 10% faster climbing and you will be dropping your LOTOJA riding buddy on every hill.